Just the opinions and musings of a man regarding things around the house, around town, around the state, around the country, and around the world. Yesterday afternoon, I left my house on the way to the grocery store. As I traveled down the highway, a car going in the opposite direction flashed their headlights at me. 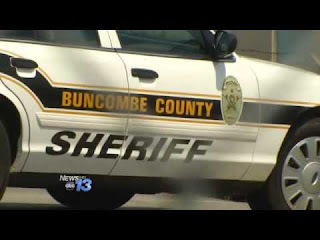 I knew what the “warning” meant, and sure enough, about 100 yards on down the road, there was a Buncombe County Deputy Sheriff's car parked on the side of the road. So I would like to say to the driver who flashed his or her lights as a “warning”...how totally irresponsible of you. There has been a rash of thefts and burglaries in the Barnardsville community for quite awhile now. The Sheriff's Department has information about who these individuals are that have been breaking into utility buildings, barns, storage sheds and more, and are looking for them. They even stole my landladies golf cart 2 months ago or so. With your actions you could potentially tip off the criminals that law enforcement is around. Don't think it's a big deal? Well, it would be a very big deal if you tipped them off, and the next time they break in somewhere someone gets hurt badly... or worse... gets killed. The same holds true when the state patrol is doing license checks. Flashing your lights as a “warning” could make a drunk driver turn around or take a side road, and get some innocent person or family injured or killed. Our actions have potential consequences, and you are doing a terrible disservice to your family, friends, neighbors, and community with your “warning”. If your “warning” leads to something bad happening...and I hope that it doesn't...then I hope you won't suffer the guilt that would result from your own idea of a good deed going badly. So please stop with the “warnings”. It could cost someone...maybe even someone you know...very dearly. The area of the map shaded in light yellow, shows the area from Asheville to Hickory, which is a distance of just over 77 miles. Attention all who live or travel in Western North Carolina. North Carolina Governor Pat McRory has proposed closing dispatch offices of the North Carolina State Troopers (Highway Patrol), including the dispatch office on Tunnel Road in Asheville. The dispatching of state troopers for Western North Carolina would then come from Hickory, North Carolina. This can result in dangerous and potentially life threatening situations for travellers due to the inevitable delays in dispatching state troopers throughout the western part of the state. Please contact your representatives in the state house and senate, by either email or telephone, and tell them you oppose the closing of the Asheville dispatch office of the North Carolina State Troopers. You may find your representatives contact information by clicking this link, and after finding his or her name in the list, click on their name for the contact info. You can do the same for your state senator by clicking this link. Just a question for anyone who might know. Are there any programs offering assistance for cataract surgery for people who have no insurance? Particularly in North Carolina (I live in western N.C.).I have cataracts in both eyes, and the left one is the worst of the two. My eyesight is getting so bad, that I am afraid that in another 6 months to a year, I won't be able to drive any longer. And, if I can't drive, I can't work. Leave any suggestions or ideas in the comments area. You may make a donation to this blogger if you are so inclined. Donate securely with PayPal. Thank you, and God bless you!